Contrary to everything you have been told and think you know, Harlow Curtice sent Edward Cole to Chevrolet Motor Division on May 1, 1952 with the mandate to engineer and build hundreds of thousands of rear-engine cars with transaxles and all-wheel independent suspensions… every year. Ed Cole brought Maurice Olley back to Detroit from GM Vauxhall in England as Director of Chevrolet R&D to work with John Dolza at GM’s Engineering Staff; on GM’s top-secret Cadet II program. Ed Cole then hired renowned European automotive engineer Zora Arkus-Duntov with much theoretical and practical expertise including exotic racing cars to compliment and round-out his team. Zora converted his 1953 Corvette Test Car EX-54 into the first running Cadet II rear-engine vehicle with an all-aluminum engine coupled to a transaxle and independent rear suspension in early 1954. 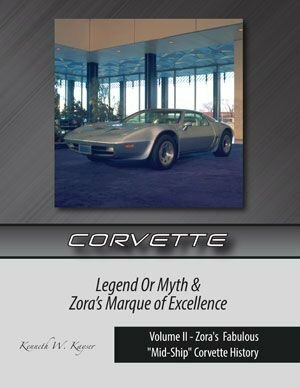 Zora and GM Styling’s William L. Mitchell began building future Corvettes with rear-mounted engines, transaxles and independent suspensions starting in 1957. Zora then built his Chevrolet R&D “R” car in May 1959 with Bill Mitchell’s GM Styling providing the body. While not specifically stated the “R” stood for either or both of its key elements; “Rear” as in engine and “Research” as in the very best. From 1960 through 1975 Zora and Mitchell collaborated on more than a dozen “Mid-Ship” engine Corvettes as Zora called them; fully backed by Ed Cole, then Bunkie Knudsen and finally Pete Estes. By 1973 Zora and Bill had perfected a spectacular “Mid-Ship” Corvette for GM’s production approval. The only thing standing in its way was John Z. DeLorean… so what went wrong? After Zora’s mandatory retirement in 1975 and Mitchell’s in 1977 their shared dream of a “Mid-Ship” Corvette was never fully extinguished and its embers smoldered yet never reached full combustion. The author was part of the “Mid-Ship” Corvette team’s development in 2008 when the bottom fell out of the global economy. Corvette's "Legend or Myth" is mind boggling and far more intriguing than old fanciful tales! 8.5" x 11.0" x 1.5" Signed by the Author With Additional Personalization Available! Includes U.S. Post Office "Media Mail" with Delivery Tracking"
Proudly Printed & Bound in the U.S.A.